Fixing directly through plasterboard into timber joists without removing the old ceiling. Creates a new isolated ceiling with a 50mm deep void for additional insulation. Ceiling boards, downlights etc, insulation, plaster and add 5% for fasteners etc. 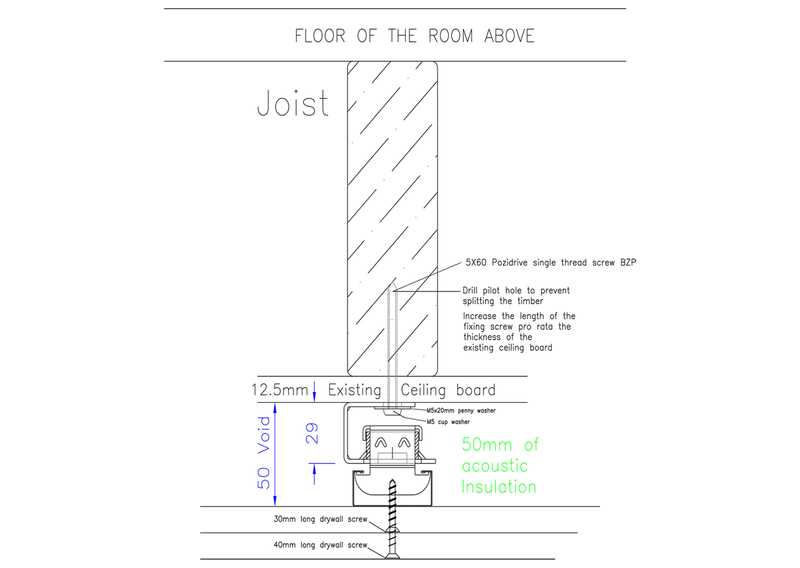 NOTE: There will be a movement of several millimetres as the weight of the ceiling sits on the Iso-mount rubber blocks: if ceiling height is critical allow for up to 5mm. Do not fit heavy items to the ceiling boards without the approval of the board manufacturer. Increase the amount of Iso-Mounts appropriately to support the additional weight. The maximum loading of each Type 2 Iso-Mount is 18kg therefore 3 mounts per sq.mtr evenly spaced to spread the load, supports up to 54kg/sq.mtr. E.g. 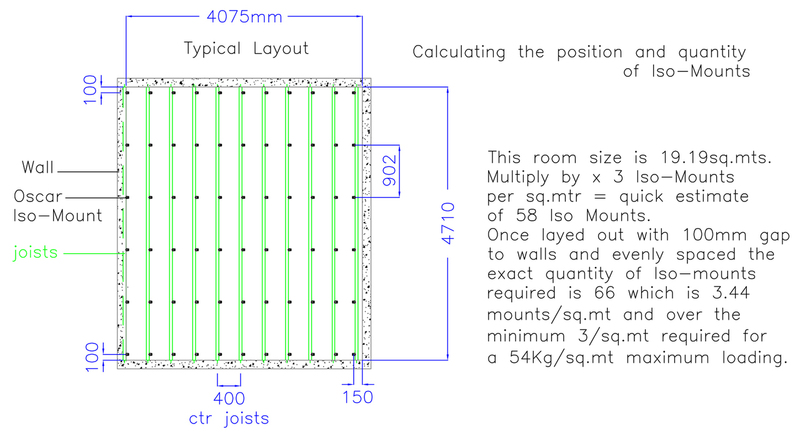 a 10m2 room x 3 = 30 + 15% = 35 Iso-Mounts. 1. Using a joist/stud detector, mark the positions and direction of the joists. All screw fixing must be through the plasterboard and securely into the joists, away from the edges. 5. For 12.5mm (0.5 inch) thickness of plasterboard use a 5x60 BZP Pozidrive single thread screw (available from our shop} to secure the Iso-Mount. 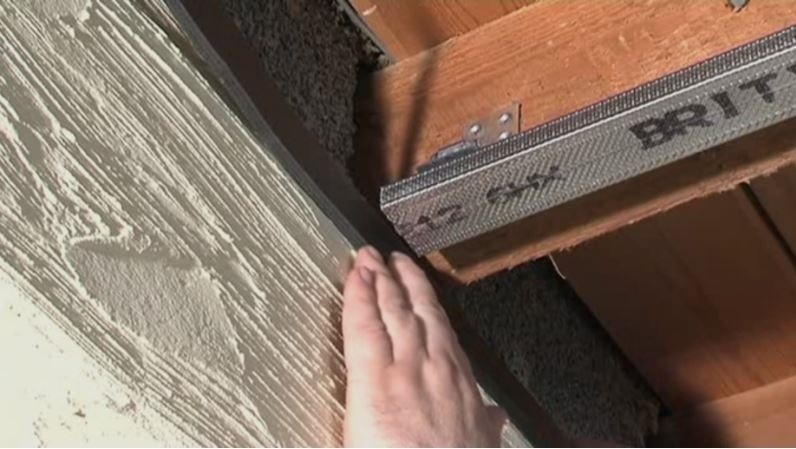 If your existing ceiling boards are thicker than 12.5mm change the length of the screws to suit. NOTE: The top hole in the Iso-Mount is 10.1mm diameter and the screw is 5mm diameter, therefore it is essential to install an M5x20 steel penny washer to reduce the size of hole and an M5 cup washer to spread the load (all available from our shop - contact us for details). This feature gives some minor position adjustment before fixing. 6. 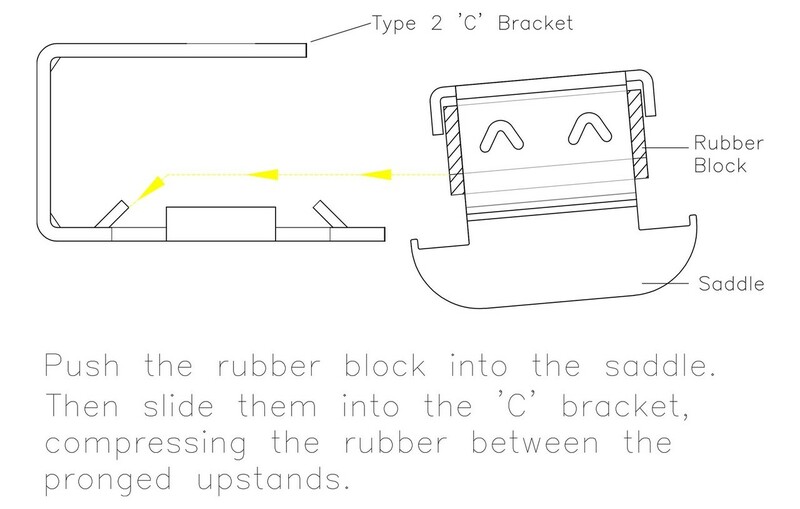 Ensure the ‘C’ Brackets are firmly fixed and levels are satisfactory, use shims if necessary. 7. When all of the Iso-mount ‘C’ brackets are in position you are ready to assemble the other 2 components of the Iso-Mount: the rubber block and the saddle. Entry of these into the ‘C’ bracket is restricted so assemble the rubber block into position on the saddle first and then slide the assembly into position on the ‘C’ bracket. 8. Once assembled and seating correctly slide the Iso-Peg into position, this will prevent the Iso-Mount coming apart when the ‘C’ channel is installed. NOTE: the Iso-Pegs are removed after the ‘C’ Channel is installed. 10. Check again that you are happy with the fixed positions of all the Iso-Mounts. 11. With the mounts in position fix the GL1 Channel. 2. Hook a length of 'C' Channel onto 1 side of the saddle of 2 Iso-Mounts that are at least 1 metre apart, then squeeze the 'C' Channel and saddle between your thumb and fingers and the channel will snap-fix into position. The fixed 'C' Channel is level and clear of the walls at both ends. The Iso-Pegs have all been removed. 2. Install 25mm wide x 10mm thick (1x3/8”) self-adhesive Oscar Foam along this line with the bottom of the foam on top of and sitting 5 mm (3/16 inch) above the line. This allows for the foam to distort when compressed by the plasterboard and space for a bead of Oscar Seal flexible acoustic sealant. 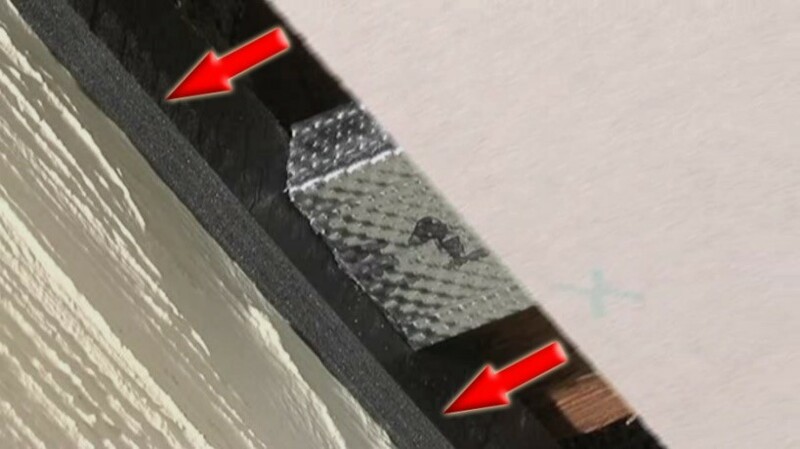 NOTE: This will prevent direct contact between the plasterboard, and the wall - a potential path for vibration and noise transfer. 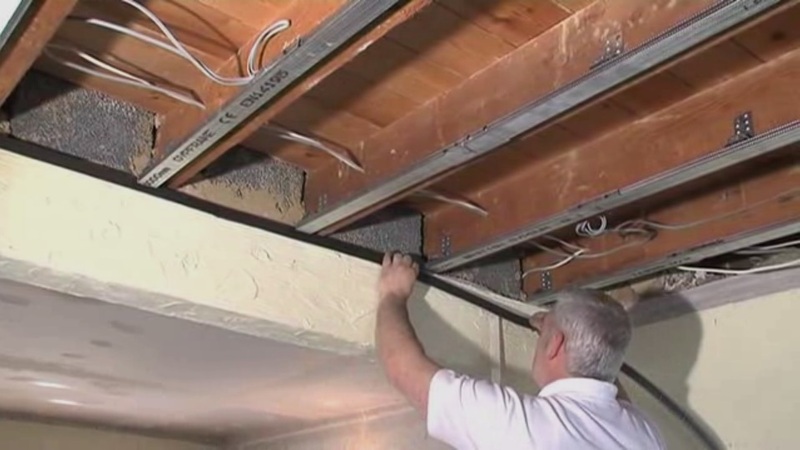 Oscar foam and the Oscar Iso-Mount combined create the floating soundproofing ceiling. High density (60kg/cu.mtr (3.75Lbs/cu.ft) or higher) mineral wool slab. For larger areas we recommend Celbar. See details below. A recycled non-hazardous cellulose insulation that is blown into the void with specialist machines. Recommended for larger areas. NOTE: GL8 wall support channel is not required.